Giaconda is a pharamceutical company helping to develop and license innovative and cost-effective medical therapies that provide extended relief for patients suffering serious glycaemic index diseases and disorders. Late in 2005, Sydney Branding Services helped successfully launch Giaconda onto the Australian Stockmarket with a Prospectus that was both visually appealing and expertly produced. The launch was supported by a direct mail campaign to 5000 addresses Australia-wide. The Giaconda brand was extended and developed with a flexible brand management document that anticipated the developing product range. Sydney Branding Services then developed an easy-to-use CMS website to communicate with the new shareholders . 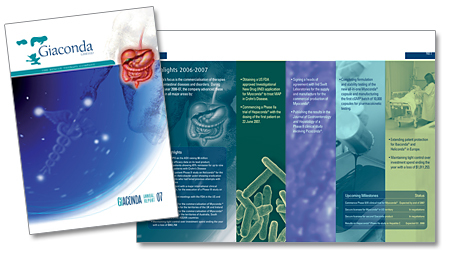 A newsletter helped to keep stakeholders abreast of the developments in the treatment of GI disorders and Giaconda's role in delivering treatments to market. 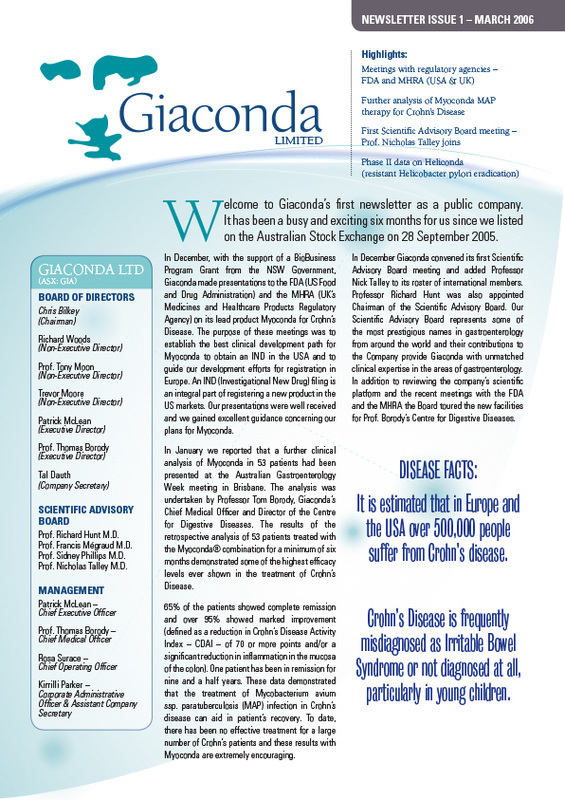 Sydney Branding Services produces the Annual Reports, and Presentation Aids for Giaconda. Giaconda’s unique identity is based on one of the most recognised painting in the worlds, ‘La Giaconda’, commonly known also as the Mona Lisa.